• Perhaps he hasn’t looked outside this week, or maybe he’s just hopelessly optimistic, but Craig seems to have motorcycling on his mind. How do we know? Because he’s picked an album with close ties to one of the more emblematic motorcycle films of all time, “Easy Rider”. 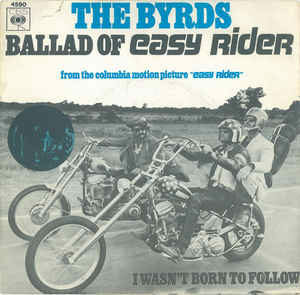 The 1969 film’s theme song, “Ballad of Easy Rider”, was written and performed by the Byrds’ Roger McGuinn; in order to ride out the commercial popularity of the movie – and the theme song – the rest of his band quickly rerecorded it and patched together an album of the same name. Ballad of Easy Rider, the band’s eighth full-length release, leads off with the title track (the Byrds version, not the film version). The remaining 10 have nothing to do with the film. • Alanya has been paying attention to the weather, but rather than embracing the fresh fallen snow she’s undergoing some psychological detachment. Yep, while you’re figuring out which weekend works best to hit the ski mountain, Alanya is sipping tropical drinks in her head. Friday, she’ll preview a bit of the soundtrack to her fantasy escape: Bob Marley‘s Legend. Released in 1984, the complication of Marley’s greatest hits is the best-selling reggae album of all time, with an estimated 28 million copies sold globally. It features all of Marley’s previous Top 40 hit singles in the UK, three tracks from his original Wailers crew (alongside Peter Tosh and Bunny Livingston) and “Redemption Song,” the final track from the legend’s final studio release, 1980’s Uprising. • Some of music’s biggest heavyweights got together earlier this week for two sold-out performances in celebration of Joni Mitchell‘s 75th birthday. Robert wasn’t invited to sing with the likes of Brandi Carlile, James Taylor, Los Lobos and Emmylou Harris, but he’s found his own way to pay tribute to one of the most lasting female singer/songwriters in modern music. He’ll feature a few of his favorite tracks off Mitchell’s fourth studio album, 1971’s Blue. Ranked 30th on Rolling Stone’s list of the “500 Greatest Albums of All Time” – the highest ranking for a female artist – Blue was inspired in part by Mitchell’s troubled relationship with Graham Nash and burgeoning relationship with James Taylor. If you were wondering, yes – both Nash and Taylor were on the stage for this week’s big birthday celebration. • Tommy will wrap up the day with the debut album from American rock band the Velvet Underground. Titled simply The Velvet Underground & Nico, the 1967 release was a commercial flop. Nevertheless, it’s experimental sounds – and iconic Andy Warhol cover – became a cult classic; it ranked at No. 13 on Rolling Stone’s greatest albums list.